These engaging cetaceans have been storied to interact with human beings in the oceans of the world. These creatures have been often seen in the wake of seafaring vessels, jumping from the surface and riding the boat's wake. There are ample tales of these marine mammals assisting distressed sailors. When you visit one of our marine mammal facilities, you will continue the age-old relationship between humans and dolphins. An interaction with these charming clowns of the sea will leave a lasting impression on you. 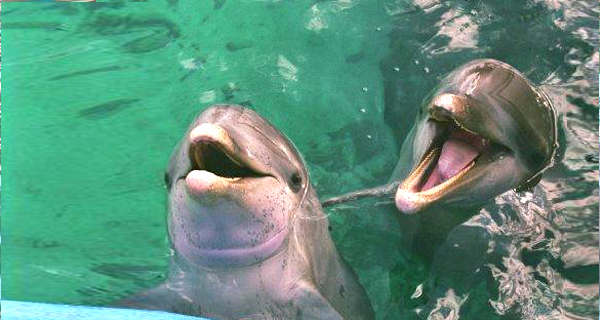 The Dolphin Swim Adventure allows you to interact with our amazing dolphins. You can pet and stroke them, kiss them, and shake hands with them. And for the best part, enjoy a breathtaking ride through the water on a dolphin’s belly or let them push you by your feet! The Dolphin Royal Swim is one of the most thrilling and exciting dolphin encounters you will find in the Mexican Caribbean. Shake hands with your new friends and perhaps get a kiss before these gorgeous mammals push and pull you through the water at breathtaking speed!